What does "ITTF Approved" mean? To ensure that table tennis equipment at the competition level is of the highest standard, and consistent among all the different brands, the International Table Tennis Federation (ITTF) has a strict set of quality and performance requirements, and will only grant approval if all the requirements are met. 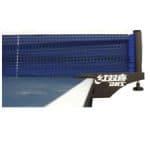 Equipment that is ITTF Approved, meets these strict requirements and is therefore legal for use in formal table tennis competition and tournaments. What equipment needs ITTF approval? Table tennis equipment must meet certain quality and performance requirements to receive ITTF approval status. The requirements are set out in the rules and regulation of table tennis, and further detailed in the ITTF ‘Technical Leaflets‘. Only equipment that is ITTF approved is legal for use in formal competitions. Manufacturers pay fees to the ITTF to apply for approval, and only if the equipment continues to meet the requirements, and the manufacturer continues to pay the fees, will the equipment remain ITTF approved. I’ll discuss the topic of ITTF Approved table tennis rubbers first, as this is applicable to most players. For rubbers, a.k.a. ‘Racket Coverings’, to receive ITTF approval status, they must meet strict requirements of quality, physical properties and performance, as set out in the ITTF Technical Leaflet T4. 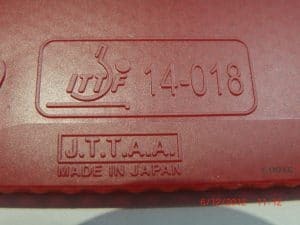 Once the ITTF approval has been granted, the rubbers are added to the List of Authorized Racket Coverings (LARC), which is updated twice yearly. Check that the rubber is listed on the latest LARC. Note that ITTF approval does not automatically mean your rubber is legal. It must also meet the other legal requirements under the table tennis rules regarding rubbers. In a nut shell, it must be good condition, unmodified and glued down flat covering no more than playing surface of the blade. Strict rules and regulations also apply for ITTF approved balls. The ball must meet all the requirements and set out in the T3 Technical leaflet, and if approved the ball will be added to the “List of ITTF Approved Balls”, which is updated regularly. You can find the latest 2018 list of ITTF approved balls here. Not only does the ITTF approve the balls upon initial testing, but they buy balls regularly through standard retail methods, to ensure the balls continue to meet the standard. Only 3 star balls can be ITTF approved, and the ITTF logo must be displayed on the ball, see example pictured right. Similarly for table tennis tables and the net assembly, the ITTF provides a list of those that are ITTF approved. Since this is usually the club’s responsibility, not that of the players, I won’t go into further detail. What about table tennis blades? Although the blade can be any size, the playing surface must be covered by a legal racket covering(rubber) to be legal, which therefore limits the size of the blade to the largest sheet of legal rubbers available. Does the competition in my club require ITTF approved equipment? Most clubs do not meet the requirements for ITTF approved flooring, as this is very expensive. However unless you’re a social club, most table tennis clubs do use only ITTF Approved balls, tables and net assembly, and require the players to use a table tennis bat that’s legal under ITTF rules, and the rubbers must be ITTF approved. Of course it’s entirely up the club to decide how strictly they enforce these requirements. but for the more official competitions and tournaments usually the rules are applied and equipment is checked by umpires. It’s in the interest of the clubs to apply these rules, so that the players are prepared for National or International competitions, should they progress that far. If you play in the more casual or social competitions, it’s quite likely the rules are not even applied, which means you can play with pretty much anything. How do I make sure I buy legal table tennis equipment? Well if you buy equipment from a shop like OOAK, you can be sure the equipment is legal and ITTF approved (unless otherwise marked). We assemble bats free of charge, and in this process we also ensure that the complete bat is legal and ready to play when you receive it. What does 'ITTF Approved' equipment mean, and how do you make sure your equipment meets the requirements so that it's legal for competition? This article explains the details, and provides a check list so that ensure your equipment will be legal.